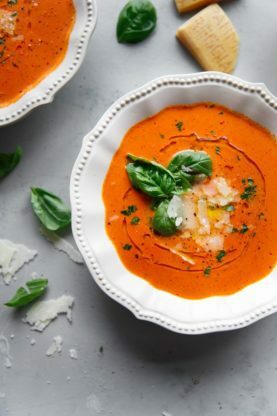 Homemade Tomato Basil Soup Recipe (Instant Pot) – Rich and comforting, the incredible flavors of tomato, sherry, butter and cream create the perfect soup recipe done quickly in an Instant Pot! The leaves have fallen, the temperatures have dipped and the oversized warm fleeces have come out of the closet. In fact, it is officially snowing in Chicago. Yep it is just November, Thanksgiving hasn’t arrived it and it is officially snowing. If you’re anything like me, the cold weather brings out my strongest urges for all things comforting. Comfort food is at the top of the list. Gooey, warm mac and cheese, mugs of hot cocoa and most importantly, large bowls of piping hot soup. So I’ve broken out my favorite kitchen product: the instant pot. There is nothing easier than a one pot soup recipe; every step and all your ingredients made in one pot for the whole family. Done in just about 30 minutes, the instant pot makes everything so much better especially soup recipes. Usually you will have to stir occasionally or even frequently when making a soup but with the instant pot, you can relax a bit. Today, I’m sharing a go-to Homemade Tomato Basil Soup recipe, perfect for chilly fall and winter days spent on the couch. The recipe comes from Ree Drummond so you know it is wonderful. It starts with simple aromatics: onions and butter. The butter adds subtle richness while the onion offers a bit of acidity to balance out the sweetness of the tomatoes. The bouillon cubes, salt and pepper brighten the flavors in the soup. Note: You can replace the chicken bouillon cubes with vegetable flavored if you would like to go for a full vegetarian soup option. Each fresh herb, especially the addition of fresh basil, contributes an earthy freshness, making the soup complex and layered with flavor. The Sherry adds warmth, sweetness and a Christmas-y quality that you never knew you needed in a tomato soup. 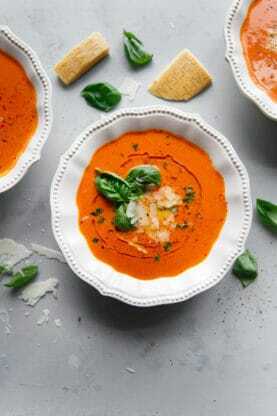 Can Easy Tomato Soup Taste Great? In the end you’re left with the perfect tomato soup. Each spoonful is sweet, salty, fresh and incredibly comforting. You’ll easily find yourself craving bowl after bowl. So skip all of the unnecessary steps like using an immersion blender, adding roasted tomatoes, cooking over medium low heat or adding to a dutch oven. Instead bust out the instant pot, make yourself a grilled cheese sandwich and cuddle up under a warm blanket. It’s soup time. If you love soup, definitely check out these other incredible soup recipes on my website. If you love potatoes, this Potato Soup Recipe will light your soul on fire. Soup doesn’t get better than my Mexican Chicken Pozole Verde recipe! If you love a vegan option, try this Chipotle Black Bean Tortilla Soup recipe! 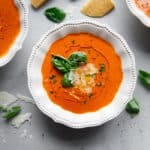 Homemade Tomato Basil Soup Recipe (Instant Pot) - Rich and comforting, the incredible flavors of tomato, sherry, butter and cream create the perfect soup recipe done quickly in an Instant Pot! Set your Instant Pot to saute and allow to warm. Add butter to melt. Add onions and cook until translucent. Add the diced tomatoes and tomato juice and stir to combine. Add in sugar, bouillion cubes, salt and pepper, then stir and lock lid in place. Set cooker to manual then set timer for 3 minutes. When timer is up set to Naturally vent then add an additional 10 minutes. Stir in sherry, heavy cream, basil and parsley. Sprinkle on parmesan if desired before serving. You can totally replace the chicken bouillon cubes with vegetable bouillon cubes for a completely vegetarian soup option. Is it a good idea to freeze this soup. Would it still taste as good? Yes you can still make it over the stove. Also the sherry does add a nice distinctive flavor however you can replace it. This sounds wonderful and tomato basil is my favorite. I have to watch salt intake, do you have nutritional values on this dish? The tomato juice is what concerns me. Thanks! Yes the info for nutrition is below in the recipe. Let me know if you have any questions. Great soup recipe for these cold fall and winter days!! I will try this recipe soon.